In July of 1962, when I was three, Mom, Dad and I flew to Rome. On the flight over, while I looked at the clouds below us, I kept asking to go out and play in the snow. We went to the Vatican where all the cardinals were dressed in red robes. I thought they were all Santa Clauses. From Italy Mom and Dad took me to Ireland, England and France to visit family and the land they hadn’t touched for seven years. It was also their first chance to proudly show me off. I don’t recall much of meeting my relatives. What I do remember is being fussed over by my aunts who had anticipated meeting me for three years. After four weeks overseas we returned to Sudbury. In August of 1963, I got my wish for a bigger family. Mom and Dad adopted Catharine when she was nine months old. Catharine was born on November 11, 1962 at the Memorial Hospital in Sudbury, Ontario, and put up for adoption from birth by an unwed mother – a common practice back then. She was a ward of the Children’s Aid Society. I vaguely remember the day two women from the CAS brought Catharine to us. With curiosity I watched this little baby girl lying in her pram as Mom and Dad spoke to the women. When they left Mom, Dad and I looked the baby lying in her pram. She was watching us. “Yes Brian. She is your baby sister, Catharine,” Mom answered. My sister! I smiled as my heart leapt with joy. Now I was like my friends. Mom picked Catharine up and held her close to me. Wide-eyed with wonder I reached out as my hands clasped hers. I loved her immediately. I watched Mom and Dad bathe, change, feed and comfort Catharine. Dad was unusual for a man from his era in that he didn’t mind giving his children baths or changing diapers. I wanted to help as much as I could. It took a few weeks for Catharine to settle into her new life, but she adjusted, and we became a family of four. Until that time I had imaginary friends. One of them was Fred Flintstone whom I played with often. My imaginary friends were very real to me. One day Dad came home from work and sat down on the sofa. Straight away I cried out, “You sat on Fred Flintstone.” Dad quickly stood up apologizing to me and then turned to apologise to an invisible but squashed Fred Flintstone. The day Catharine arrived my imaginary friends disappeared. I had a sister now who filled up my playtime. I called her Kate. I can’t remember calling her anything else. That is except when we were mad at each other and then she was Catharine. But these times were rare. Catharine and I enjoyed each other’s company and companionship. We shared many secrets and totally trusted each other. We had a strong bond between us. Mom, Dad, Catharine and I would often go for walks by Lake Ramsey which is surrounded by the city of Sudbury. I climbed up the side of the life guard’s chair at the public beach as Dad watched. It was a tall climb up to the top for me but eye level for Dad. When I got there I proudly surveyed the houses and hills across the lake. Then Dad lifted me off the chair and put me down on the ground where I would turn around and climb up again. When the four of us went swimming at Lake Ramsay we put our swim wear on under our clothes before we left home. We dropped our street clothes at the beach and be ready to go into the water. One time I ran off toward the deep water where the bigger boys were swimming. Dad had just dropped his pants when he saw me run off. He started to run after me only to be tripped by the shorts around his ankles. In the heart-stopping moments when Dad struggled to get the shorts off his ankles and scramble to his feet seconds turned to minutes. “Do you know how long it takes to get your shorts off?” he said reliving the moment. Dad had almost caught up with me as I jumped into the water. He leaped in after me and grabbed hold of me just as I was bobbing back to the surface spluttering and laughing. I was having a great time. Dad had his heart in his throat as did Mom who watched all of this from where she and Catharine stood. “‘Twas The Night Before Christmas.” It was my bedtime story of choice from Halloween until Easter. Even though I didn’t know what an elf was or had never seen a mouse in our house, that timeless rhyme would cast its spell every night. The year Debbie, Jill and I turned five, our mothers took us to register for Kindergarten in the fall of 1964. Debbie and I would go to St. Bernadette’s and Jill to another school. During the summer tragedy would strike. Debbie and her family were out boating on Lake Wanapitei with another family when a storm blew up. The other family turned around making it safely to shore. Debbie and her family kept going. Their boat became swamped and all were drowned. Debbie and her father’s bodies were never recovered. As a five year old I couldn’t understand the tragic loss of life. All I knew was that Debbie was gone and her house was strangely quiet. “She’s gone to Heaven, Brian,” Mom said softly. I had no idea where Heaven was but I was comforted to know that Debbie was some place. I thought she would come back to see me. When September came Mom saw me off on the school bus alone. As I climbed aboard I turned and cheerfully said, “Bye Mom.” We waved to each other through the window as the bus pulled away. What I remember most about school are the bus rides, the hallway skylights and the large rooms with all the desks which made the school building look different from any other I had seen. All the teachers were nuns who wore full habits. Three months after I started Kindergarten Dad accepted a job as the Clinical Chemist at McKellar General Hospital in Fort William (now Thunder Bay) in Northwestern Ontario. We had to move. Mom and Dad held a going-away party for me one stormy winter evening in February before we left Sudbury. Naturally I invited my whole Kindergarten class plus all my friends. Nearly everybody came. It was hotdogs for everyone topped with the usual ketchup, mustard and relish. This was a time when all parties were special occasions. The girls wore dresses and the boys wore dress shirts and pants. Along with everyone dressing up they each had a present for me which included a kiss on the lips from Jill. When the party was over Dad had the task of driving some of the kids home in his little VW Beatle at night in a snow storm. I had a wonderful time being the centre of attention. Little did I realize that along with the happy excitement I was saying good-bye. In April, 1965, the morning of moving day came with a late winter snow storm. I remember the movers having to shovel snow off the floor and out the kitchen door as they loaded the house contents into the moving van. The house furnishings would follow us to Fort William. The four of us had an hour to look around the empty house before Jim, a family friend, arrived to drive us to the train station. As we got to his car in the driveway the neighbours from across the street and next door were outside to see us go. In the five years we were on Dublin Street we had made some close friends. We waved back as we drove off. At the train station Jim wished us well as we said good-bye and thanked him. “We’ll be in touch,” we said as the four of us boarded the Canadian Pacific Railway’s passenger train, The Canadian. As the train pulled away from the station I was full of excitement set to embark on my new adventure. The next chapter in my life was beginning. I could not have imagined how my life was about to change. I glanced into Mom’s bedroom from the hallway as the afternoon sun streamed through the window. The light beckoned me to go in. I took a deep breath to summon my courage and entered her room. All that remained in Mom’s bedroom was the furniture. I had been through her closets filled with neatly hung dresses. They reminded me of so many celebrations and family occasions. I had emptied her bedside table and dresser drawers. Only one thing remained – Mom’s jewelry box atop her dresser. Mom kept anything personal to herself in her jewelry box. I had avoided looking in it when I sorted through her belongings for that reason. I felt I would have intruded on her privacy. Mom’s jewelry box was now covered with a sifting of dust. In the back of my mind I was apologizing to her for the intrusion as I lifted the hinged lid to reveal two trays of jewelry. I found her favourite pearls, the diamond earrings Dad gave her for their 25th wedding anniversary and the flower broach Catharine and I gave her for Mother’s Day. I pulled open the bottom drawer. In it was a bulging envelope which contained a letter Mom had written. It was dated six months before her death. As I unfolded the letter I sat down on the side of her bed to read it. I was so pleased to read in the November Catholic Register of your healing prayers and those who have benefitted from them. I regret not hearing of you before or I would have attended your healing service. Father, may I impose on you to pray for me and my son. I have been suffering from anxiety and depression for eighteen years. It is really wearing me down. Like the woman who said to Jesus I feel if I could touch the hem of your garment, I could be cured. Father, will you please pray for me for deliverance from this debilitating disorder. My son Brian, who is now 39, had a brain tumour when he was a child, but not diagnosed until he had surgery six years later. 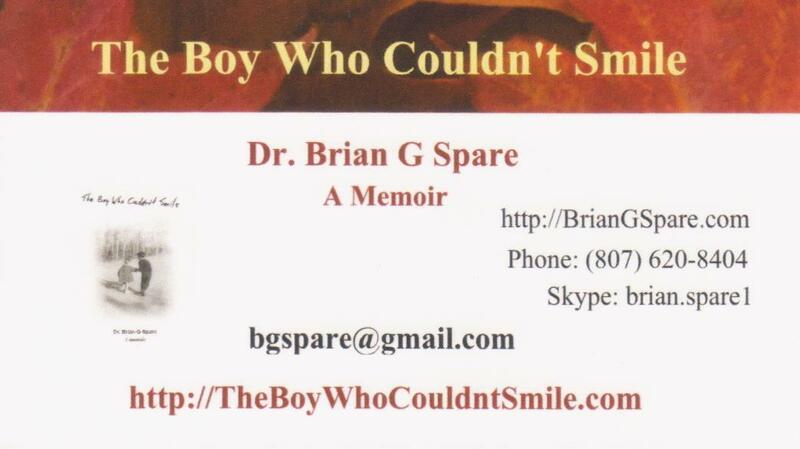 It left him with bi-facial paralysis and medication prevented him from growing. He is extremely bright. Because of his eye problems he was unable to go to school. My husband and I taught him at home. He made it part time through university right to his PhD. I read most of his material to him. He has had about 16 surgeries, some as long as 6-8 hours. Unfortunately, nobody will hire him because of his facial paralysis. We started him in business, but the “big guy” undersold him. My husband died on Sept. 1/98. I don’t have the money to keep him. Would you please pray that God will intervene and somebody will hire him. I feel really sorry about your illness. I know the patience you need to have dialysis on top of your cardiac problems. I pray for you. I hope they are heard. Father, please intervene for me. When she was young Mom had a broad smile that lit up her face. She had a hearty laugh and her eyes sparkled. As the years passed her brilliance faded as depression took hold of her. I didn’t fully realize how deep it was until I read this letter. Mom, as well as Dad, took pride in my achievements and championed all my ambitions. I was fortunate to have such dedicated, loving parents who were always there for me. A deep forlornness welled up within me as I fathomed, all at once, the events over 40 years. My face could not express the grief in my heart, but a voice in my soul cried out for the life that had come to a screeching halt. Mom was gone and Dad had passed away just nine months before. My life as I knew it was about to change in a very big way. My parents told me the story of my birth many times. I was conceived after five miscarriages and they saw my birth as a miracle. There were so many girls in both families Mom and Dad were sure I’d be a girl. Dad asked, “How’s Cathy today?” They chose the name Cathy for their baby girl. When the day arrived – surprise! My parents couldn’t name me Cathy so they settled on Brian after one of Mom’s uncles. They happily counted my fingers and toes. 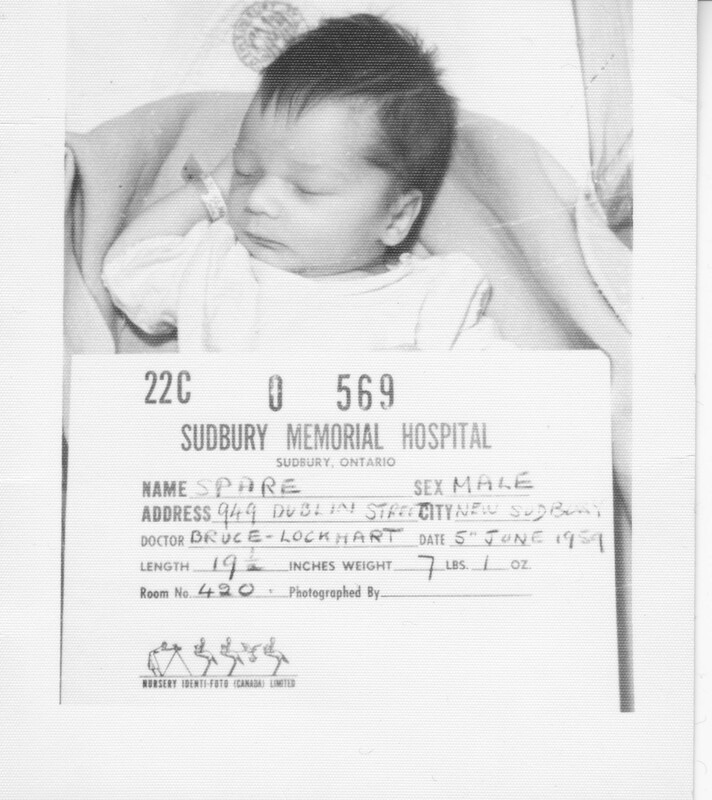 I entered the world 9:15 AM June 3, 1959 at the Memorial Hospital in Sudbury, Ontario, weighing in at 7 lbs 1 ounce. When they brought me home from the hospital Dad carried me in from the car very slowly and carefully as if I was a very fragile glass treasure. Dad was a proud father. He sat me on his shoulders to walk places while I grabbed a tuft of his hair in each hand like reigns on a horse. Mom finally had to tell him, 3“Brian has to walk too.” Dad said the first few years after I was born were some of the happiest of his life. My first childhood memories are of Sudbury in our split level house on Dublin Street. I was a happy, active, healthy boy interested in everything. My natural curiosity led me on a journey of discovery every day. Needless to say my inquiring mind kept me very busy. Each new found treasure brought a rush of adrenaline and excitement that inspired me onward. Once a week Mom put my little wooden chair by the front window. I stood on it to watch the garbage men collect the trash door to door down one side of the street and up the other. I imagined the many treasures I could find in all that lovely garbage. I thought garbage men were the greatest. Mom found ten minutes of rest. I was honest too. 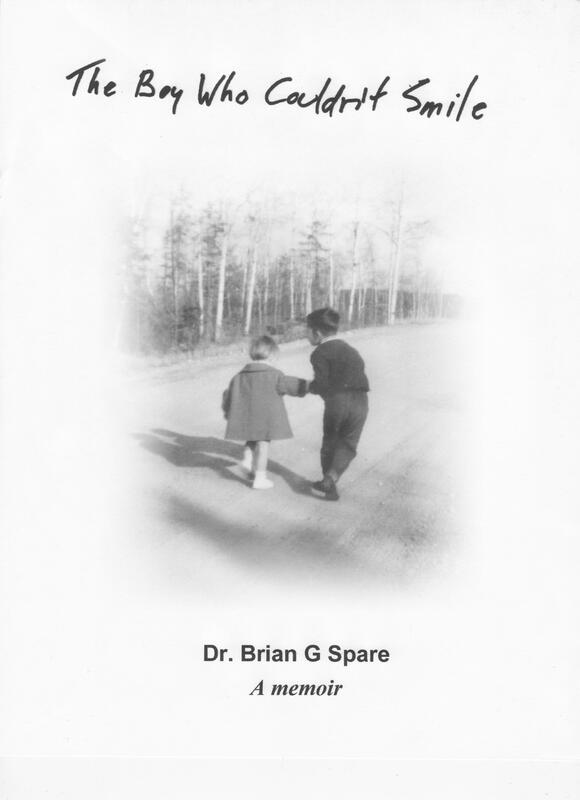 If Mom or Dad asked me, “Brian did you do …?” and I didn’t want to admit to it I wouldn’t lie. I said, “I wish you wouldn’t ask me that question.” That was enough of an admission of guilt for them. I also took things literally. I was taught to say please and thank you. When I thanked somebody and that person responded, “You’re welcome.” I replied, “No I’m not I’m Brian.” One Sunday as the priest came out to say mass I called out, “Fr. Ted has a new haircut.” My comment prompted laughter from the congregation and Fr. Ted. Being a pleasant and sociable child I soon attracted the attention of all the young girls in the neighbourhood who would stop to play with me. Two little girls my age, Debbie and Jill, really liked me. Debbie lived two doors away and guarded me jealously from any other girl. Jill, who lived five doors down, was undaunted by Debbie’s protective efforts and continued to seek my friendship. I spent a lot of time playing at both their homes and they at mine. 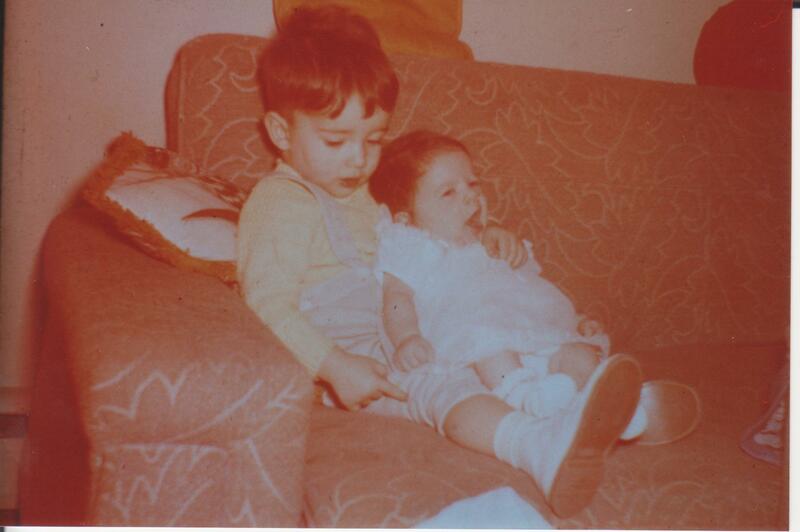 Debbie had two older brothers and a large extended family with lots of aunts and uncles. Of all Debbie’s relatives her Uncle Cliff was her favourite. He was always around the house horsing around with Debbie, her brothers and with me. I called him Uncle Cliff too. Jill had a baby sister. I wanted an uncle and a brother or sister like Debbie and Jill. After Sunday mass Mom, Dad and I would go to a Dairy Queen where I ordered a black ice cream. The man who served us each week knew I wanted chocolate. He greeted me with my favourite treat and a big smile. I named him Uncle Joe. It wasn’t his real name but he was tickled and quite proud to be my Uncle Joe. I had two uncles now but I still wanted a sibling.